Oil and gas will continue to play a significant, long-term role in the global energy mix. For the ninth consecutive year, Saudi Aramco participated in the International Petroleum and Technology Conference (IPTC) held in Doha, Qatar, where Saudi Aramco engineers and scientists showcased their research and technological developments in petroleum engineering and geosciences. Amin H. Nasser, President and CEO of Saudi Aramco, also took part in a CEO plenary session held under the IPTC theme ‘Technology and Partnerships for a Sustainable Future’. 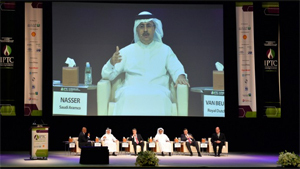 In his remarks, Nasser said: “In the long run, oil and gas will continue to play a significant role in the global energy mix, yet we acknowledge emissions need to be managed.” Addressing the role of technology in the context of climate change, Nasser said “technology is the key component in addressing [climate change] challenges. Technological advancement in areas such as carbon capture and storage, allows Saudi Aramco to address global climate change challenges without compromising its unwavering commitment in meeting rising energy demand from millions around the world.” Discussing the industry’s contribution to addressing climate change, Nasser mentioned Saudi Aramco’s central role in the strategic Oil and Gas Climate Initiative (OGCI). The OGCI focuses on driving practical action to manage carbon emissions through innovative technological developments, aiming for long term solutions to meet rising global energy demand while managing climate change. At IPTC Saudi Aramco showcased its technological innovations and presented five technical papers by subject matter experts from Petroleum Engineering and Development and Drilling and Workover, highlighting the latest technological developments in these two areas as well as extreme reservoir contact. Consisting of a 62 session technical program, two plenary sessions, nine conference streams and exhibits from all major sponsors and supporting companies, the 2015 IPTC attracted approximately 7,000 attendees from leading oil and gas companies and professional societies in the petroleum industry from the region and beyond. The IPTC is an annual event rotating between Asia Pacific and the Middle East, organized to further the advancement of scientific and technological knowledge related to the exploration, development, production, transportation and processing of oil and natural gas.